Formally organized in 2006, the Environmental Funders Network launched the Quality of Place grant program in 2009. In the three-year run-up period, members designed the process for collaborative grantmaking and the means for oversight, involvement, and evaluation. One major goal that emerged early on was re-examining the arm's-length relationship that often exists between funders and those receiving grants. In traditional philanthropy, foundations decide on objectives they want to promote and then fund organizations they think may be capable of achieving them. The process of seeking and administering grants, however, may take the receiving nonprofit in directions that differ from its own plans. Indeed, in satisfying a grantmaker, an organization may lose important parts of its vision. The Environmental Funders Network decided instead to work closely with the organizations it selected and follow their lead. The resulting collaboration has been challenging, but the results have surpassed the scope of the original vision. 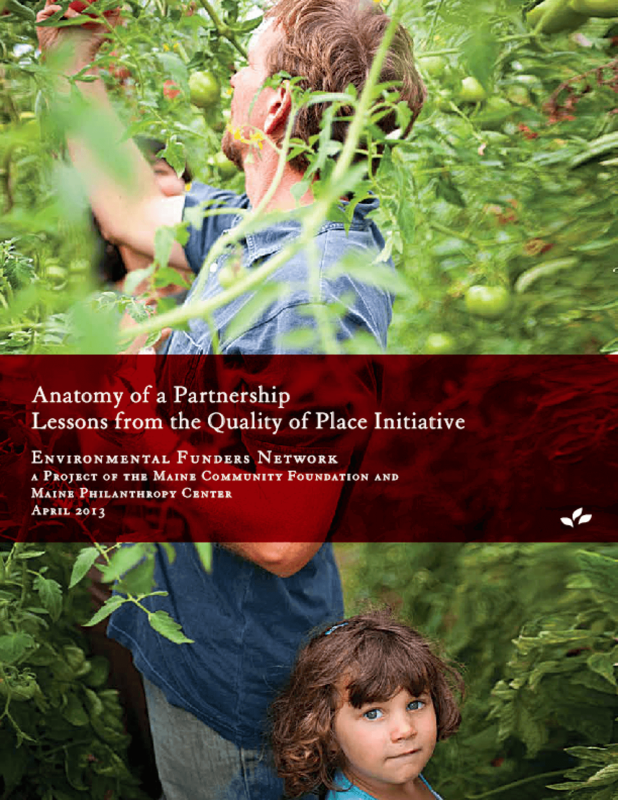 The Quality of Place concept encompassed not only Maine's remarkable landscapes and recreational assets, but also its working forests, farms, and waterfronts, and the built environment, including often neglected historic downtowns. Uniting these elements within a single grantmaking program encouraged alliances to emerge among complementary but previously unconnected organizations. Quality of place also embraced a larger vision of sustainable prosperity than could be realized by any specific venture or single purpose. Copyright 2013 Environmental Funders Network.